There’s nowhere to go from there but up, and, indeed, the rest of the links I have for you are cheerful. My favorite comes from ilovedogfriendly.com, a site that helps you identify dog-friendly hotels and other resources, and it’s a list of ten U.S. hospitals that allow a patient’s pet dog to visit. Speaking of pets in public places, check out this useful post from Keep The Tail Wagging about pet etiquette at street fairs and festivals. The collection of fun places to go with your dog starts with a review of an Orlando dog park from Terrier Torrent (with a link to an earlier post about another one), and then heads north. Arlington, VA is the latest community to allow restaurant owners to apply for a variance allowing dogs to join their owners on outdoor patios. I was happy to find this tool from the NYC Parks & Recreation department, letting you identify dog-friendly city parks (I clicked on the dog icon to get the page you’ll see). Boston.com posted a list of six appealing suggestions for dog-friendly vacation lodgings in New England. Heading west, a Dallas restaurant scheduled to open in May will be a “modern day ‘roadside’ burger stand” with a large outdoor patio open to diners with dogs. Speaking of Dallas, residents and visitors might want to follow the active and information-packed Facebook page for Dog About Town. Another ilovedogfriendly.com post highlights five dog-friendly coffee shops in Los Angeles. Cementing its reputation as a truly dog-friendly destination, Mendocino has its own local dog blogger, Hairy Putter’s Review Blog. The last spot in the U.S. is only a couple of miles from where I’m sitting as I type this: CityDog Magazine has some nice suggestions for dog-friendly things to do in Pioneer Square, the historic heart of Seattle. Why is this screenshot so small? Why??? The iPhone version is only available from the U.K. store; there also appear to be a couple of Android versions. The other app I should tell you about is from Alastair Sawday’s, which means that the listings will be splendid — but a customer service rep told me that this version only tells you, via an icon, if the pub you’ve clicked on is dog-friendly. 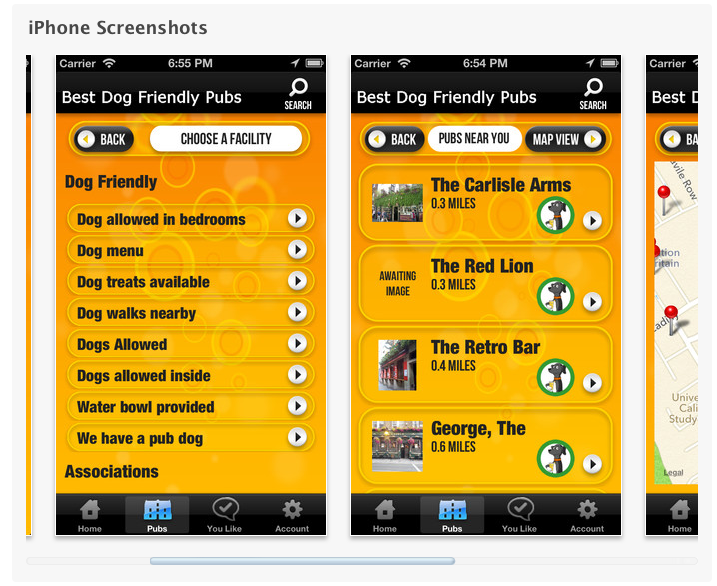 As yet, there’s no way to search for dog-friendly pubs. Speaking of the U.K., check out this helpful tool from Britain’s Finest, identifying dog-friendly gardens open for visiting. And while we’re listing dog travel resources, how did I miss, until now, the series of “Dog Friendly Walks” books from Walking with Boomerang? Also new to me: A dog travel blog called Phileas Dogg, with many things you’ll want to click on, especially including the Attlee’s Adventures tab. The last U.K. link I have is to a lovely-looking campsite near Truro, in Cornwall — you know a place is truly dog-friendly when they have a pets-welcome page like this one. On to France! Gigi Griffis posted some tips about enjoying Paris‘s Montmartre neighborhood with a small dog, and I discovered another new-to-me dog travel blog called Travels With My Spaniel, about hiking in the French Pyrenees region. One last spin of the globe brings us to Australia, which is starting to catch on to the dog-friendly thing, though it’s unclear whether articles like this one, about the new “Palazzo Pooch Package” at the Gold Coast Palazzo Versace Hotel, are going to do much for the cause. Neatly enough, the last three links I have for you are all about gear. Montecristo Travels drew my attention to the Buddyrider Bicycle Pet Seat, and an inventor is marketing another approach to a locking leash, called the StayBoy Lock (to protect your pup while you race into a shop). Doggie Stylish pointed me to a post on Martha Stewart’s blog about making a soft crate pad out of two hand towels. Not difficult, not expensive, and machine-washable. I’d make a stack of them, though, since 1/2″ thick batting is pretty thin (you could use thicker batting, but in that case you’d likely want to make your pad out of a bath towel folded in half, to compensate). Now that I’m thinking about it, why not make a pad out of a t-shirt? You’d just use the body, cutting off the sleeves and the neck — Martha would never approve, but it would certainly be soft. Alastair Sawday's Android app Arlington Autralia bicycle bike Buddyrider campsite coffee shop Cornwall crate pad Dallas dog parks dog-friendly festivals Flexi French Pyrenees gardens Gold Coast hospital hotel iPhone leash locking Los Angeles Mendocino Montmartre New England New York NYC Orlando Palazzo Versace Paris park patio Pioneer Square pubs restaurant retractable leash Sawday's Seattle StayBoy street fairs Truro U.K. Thank you so much for the mention and sharing other useful posts. I love finding new blogs to read and follow.